AMG is to Mercedes as M is to BMW or RS is to Audi…sort of. Like BMW and Audi, the AMG letters represent the top of the line performance model for a particular vehicle. AMG takes it to a higher level. From the first stages of a cars development, AMG engineers are involved customizing exterior features, body, suspension, drivetrain and of course engine specifications. In fact, every AMG engine is hand built in Affalterbach, Germany and every highly skilled technician builds one engine at a time from start to finish. AMG calls this “one man, one engine” and their signature is placed on the engine plate of each motor he or she builds. Having over 500 horsepower and/or over 500 pounds of torque is extremely rare territory for any car, let alone a 4-door sedan. Mercedes Benz has been playing in this lofty range since 2003 with the introduction of the E55 AMG. The Stuttgart factory gave birth to another similarly powerful brute in 2007 with the introduction of the 507hp E63 AMG. 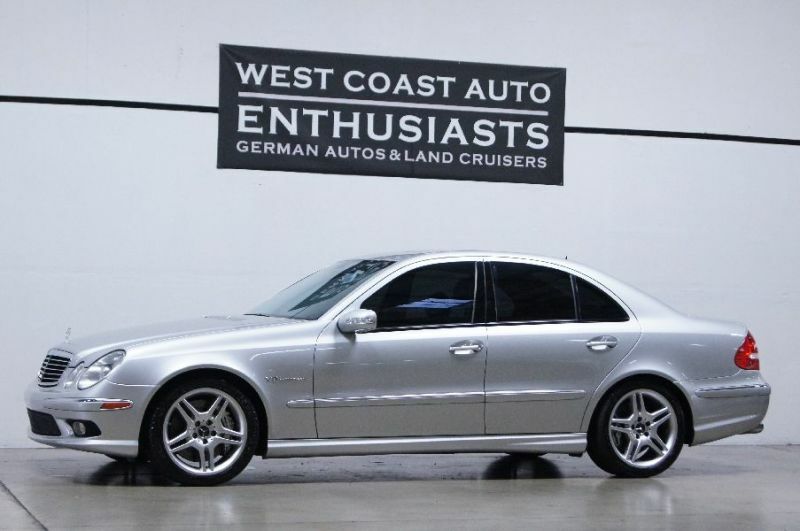 The E55’s power is generated from a supercharged V8 that produces 469hp and a thunderous 516 lb-ft of torque. This hand built beast is force fed an immense amount of air via a Lysholm-type, twin-screw supercharger. The belt driven supercharger produces a maximum of 11.6 psi and profoundly assists in giving the 5.5 liter V8 516 lb-ft of torque as early as 2650 rpm. The E63 introduced change into the AMG family. 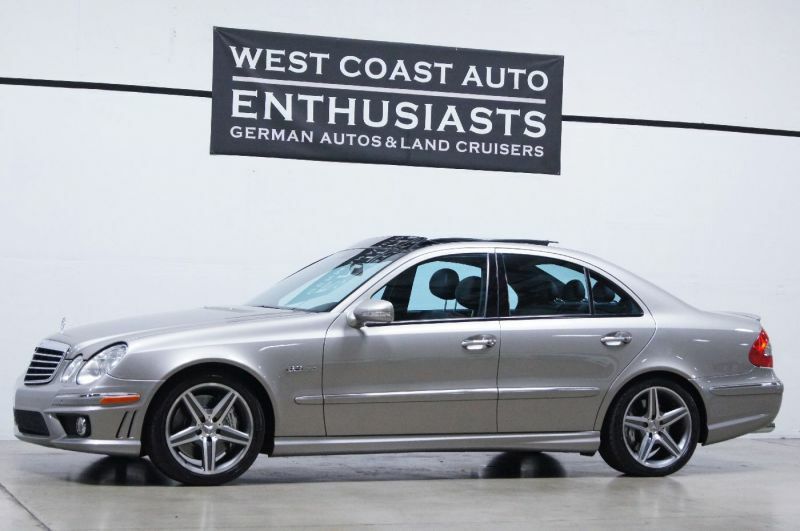 The torque and horsepower numbers were practically reversed, causing some experts to wonder if they would miss the torque crazy E55; their fears were happily nulled by the 507 horses mated to an all-new seven speed automatic transmission. The new engine produces a still impressive 465 pounds of torque and has many technological advances. Even with the reduced torque numbers, the greater horsepower and new drivetrain propels the E63 to 60mph in 4.3 seconds, quicker than the E55 at 4.5 seconds 0-60mph. Mercedes did not disappoint loyal followers of the E55 with the E63, in fact, they were pleased. The new naturally aspirated V8 is a remarkable addition to the AMG line, and it is sure to keep the E63 at or near the top of the ultra-powerful sedan market. We are proud to have both examples in the showroom. It is one of our favorite weekends. The 2013 Portland International Auto Show opens this Thursday the 24thand runs through Sunday the 27th. It is being held at the Oregon Convention Center, nearly all manufacturers will be represented and showcasing their 2013 models. This year, eight manufacturers including Toyota, Honda, Subaru and Scion will be offering the best hands on experience – test drives. The “Luxury Loft” is new this year and will be home to luxury and exotic brands. This is where we will be spending a lot of time looking at the newest German vehicles from Audi, BMW, Porsche, and Mercedes. New models including the BMW X1, Mercedes SL550, and the Audi Allroad will be on display. The Toyota Land Cruiser has the longest running history of any Toyota vehicle that is still in production, dating back to the 1950s. 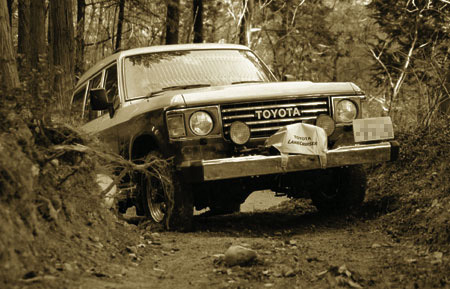 The Toyota brand was created roughly 25 years prior to the first Land Cruiser. This iconic go anywhere vehicle has earned a top position in the hearts and minds of many Enthusiasts. The beginnings of the legendary Toyota Land Cruiser began in January of 1951, with the first prototype called the Toyota BJ Jeep. The BJ Jeep was powered by a 3.4L inline six that produced 75hp. Toyota produced a “Jeep” like prototype in response to pressures to create a domestically manufactured four wheel drive compact truck. 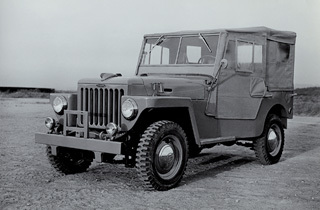 After some initial difficulties with orders, in 1953, Toyota began large-scale production of the BJ Jeep. One year later, the Willys Company claimed a trademark violation, and in response, Toyota renamed the BJ as the Land Cruiser. Growing sales of the BJ Land Cruiser provided positive reinforcement that Toyota was headed down the correct path. In 1955, Toyota began a second line of Land Cruisers, called the 20 series, to grow alongside the BJ. The 20 series Land Cruiser was created to strengthen international sales and to attempt to gain United States contracts for the Korean War. 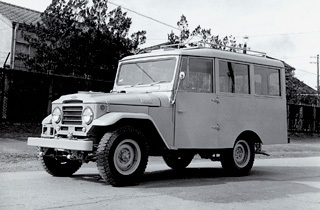 There were 10 variations of the 20 series, ranging from the small truck FJ25 to the long body FJ28V. Toyota also created the 30 series in 1958 that had a longer wheelbase and would precede the future successful 55 series. Production of the 20 and 30 Series ended in 1960. Toyota was so confident in their new Land Cruiser that it was used as the primary vehicle to be introduced to foreign markets. The tactic proved very successful, and Toyota was able to export their full line of vehicles to many developing foreign markets due to the positive reputation of the Land Cruiser. The 20/30 series was replaced by the classic 40 series in 1960. Although similar looking to the 20 series, Toyota made many advancements with the 40 series, creating a completely different 4X4. A 125hp engine was mated to a more advanced 3-speed transmission with a low range sub gear that increased the Land Cruiser’s off road prowess. Popular models included the FJ40V hard top, FJ43 and the FJ45V. Toyota increased the utility and versatility of the 40 series by offering a hardtop, pickup and wagon type body styles. During the mid 1960s, the 40 series was such a success that it became the highest selling Toyota model in the United States. The 40 series had a long run; they were manufactured until the mid 1980s. 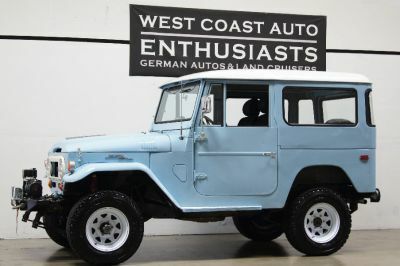 The popularity of the FJ45V spurred the creation of the FJ55V, which was the first real purpose-built four door wagon to wear the Land Cruiser badge. 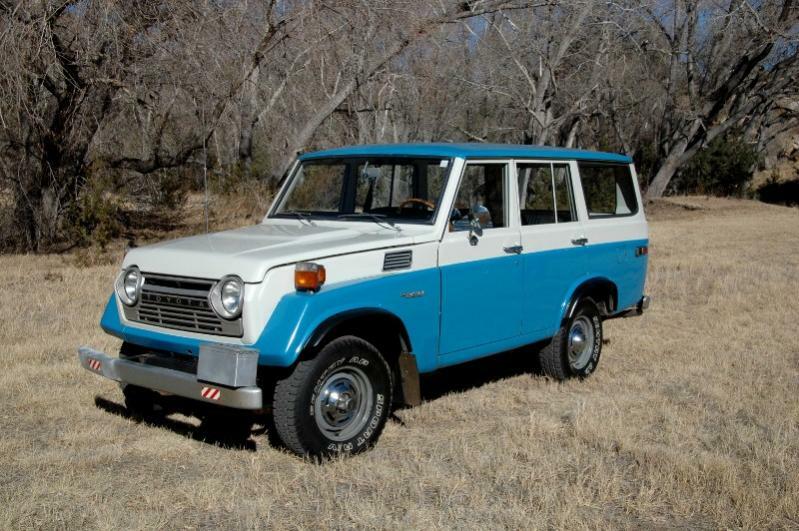 The 50 series “Moose” earned the proud nickname in America, but was also sold in Australia and Japan. The FJ55 had many technological advances over the FJ45V, including a box-type enclosed structure for the side frame, a redesigned more powerful motor, and increased safety standards to meet American requirements. One eye-catching feature of some FJ55 Land Cruisers is a two-tone paint job. The FJ55 started production in 1967 and wrapped up in 1980 with the 60 series waiting in the wings. The FJ60 arrived on scene in the newly developing SUV market. Although it shared much of the same frame and suspension design, the FJ60 looked very different from the FJ55. Toyota needed a car-like interior and an advanced 4WD system to compete against other SUVs like Land Rover. Toyota succeeded with the FJ60 and later the FJ62. The FJ60 was built from 1980 to 1987 and is easily identified with its two round headlights. The FJ62 was built from 1988 to 1990 and it has two pair of square headlights with low and high beams in separate housings. The FJ60 was introduced with a carbureted 4.2L inline six capable of producing 135hp and was mated to a four speed manual transmission. The FJ62 was even more refined with a fuel injected 4.0L inline six that produced 155hp that transferred that power through an electronically controlled four speed automatic transmission. The FJ62 also came with more creature comfort options like power windows, power door locks, and a power antenna. 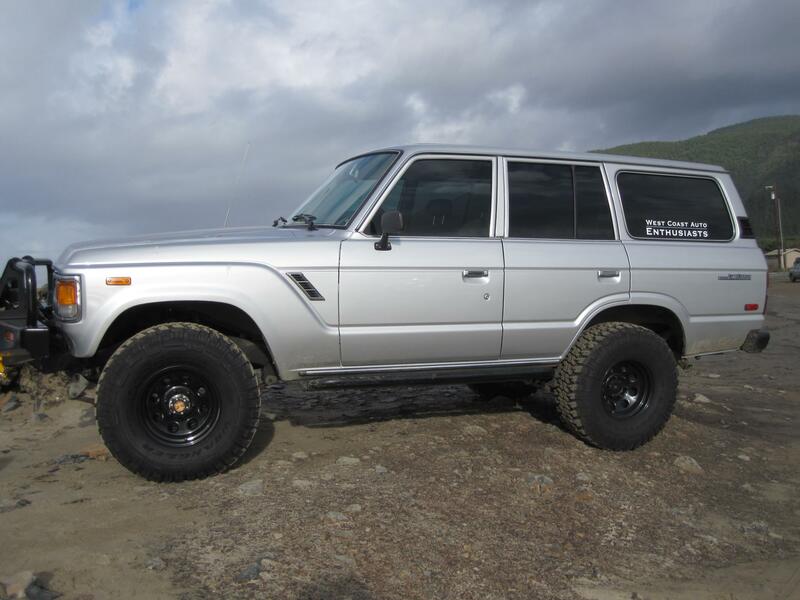 All of the classic Toyota Land Cruisers had stellar off road capability as a top priority. Land Cruiser succeeded in domestic and international markets with a combination of dominate 4WD performance and Toyota reliability. Land Cruisers are held in high regard by off road enthusiasts and we have a very special place for them in our hearts. The Studebaker/Packard Hawk debuted in 1956. There were five versions of this winged coupe by 1957, including the Pillared Flight, Power, Sky, Golden and Silver Hawk. It is said that some of the styling cues were borrowed from the Maserati 3500GT, including the long sweeping hood, low stance and coupe curves. Early models were offered with either a 185ci inline six or a 259ci V8. The Hawk was considered the flagship model for Studebaker, although the compact Lark was sold in far greater volumes. The Hawk, like all Studebaker cars, offered attractive but unique looks. It had high fins that were angled outward, long flowing lines, and the early Packard models featured a duck-bill like nose. In 1958, the Hawk was almost discontinued due to the low 8,000s sales figures. Dealers still wanted the flagship Hawk as an upscale option to the economy Lark. All Packard badging was dropped in 1959 with only the Studebaker name living on. Times were tough for Studebaker in early 1960 with a steel strike creating a shortage of steel for the company. That, along with slumping sales, postponed the Hawks second-to-last year of manufacturing. It was possible, at the time, that Studebaker was going to discontinue the Hawk line. Thankfully, in February of 1960, Studebaker continued manufacturing. Only one style of Hawk was offered, dropping all other versions, with the body remaining almost identical to the 1959 version. Changes included a 210hp 289ci V8 that was standard with an optional 225hp engine. The final year for the original styled Hawk was 1961 with 3,929 built. A “4 on the floor” was offered for the first time and every 1961 car had a special number and engraved dash plaque sporting the name of the buyer. The transmission was the same Borg-Warner that was used in the Corvette at the time. Studebaker changed the Hawk line dramatically in 1962 with the introduction of the Gran Turismo Hawk, and Studebaker ceased production of all cars at their South Bend factory in December of 1963. The company lived on through the also unique Avanti name for some years after. The Hawk has a growing following, yet still remains to be an affordable classic car. Nothing else on the road looks like a Studebaker and the Hawk line is one of the best looking. We are glad to have a 1960 Hawk currently on our showroom floor. It catches my eye every time I walk out onto the showroom. When Todd Staver started West Coast Auto Enthusiasts in 2007, he knew that he had a passion for cars. He soon learned that cars were in his blood. Evelyn, a friend of Todd’s, sent an email that contained some information about an early 1900s car company by the name of Staver. Todd researched more about this company and discovered that the Staver family began making horse drawn carriages back in the late 1800s, and then added motorized carriages to the lineup starting in 1907. The first Staver to venture into the carriage and buggy business was Henry Clay Staver, born in 1844. An entrepreneurial businessperson at-heart, Henry explored various business ventures throughout his years, and created the Staver Implement Co. in 1884. The Abbot Buggy Company joined forces with Henry Staver in 1890, creating Staver & Abbott Manufacturing Company, Chicago, Illinois. Henry Staver became the President and Treasurer. In 1893, the Staver & Abbott Co. featured the Spider Phaeton, French Buggy, Stanhope Phaeton and the Two Seat Phaeton plus a few others. Unfortunately, in 1896, Staver and Abbott closed their doors due to debt, but the Staver story does not end there. 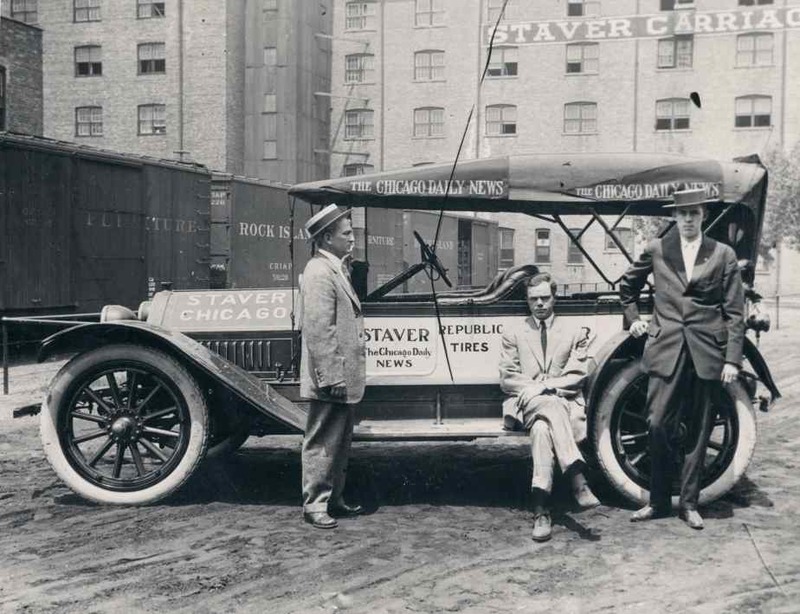 In 1899, Henry Staver revived the brand under the name Staver Carriage Company. In 1902, Henry Staver became the President of the National Carriage Builders Association. Then in 1905, Staver was featured as a vehicles exhibitor at the Lewis and Clark Centennial Fair in Portland, OR. (Little did Henry Staver know that many members of the Staver family would reside there 50 years in the future.) Henry Staver made the first leap into motorized carriages by filing a patent for a belt-type friction drive arrangement to be placed in an electrically powered self-propelled vehicle. The 1907 Staver Model C Stanhope Highwheeler was the company’s first full production automobile. Other models followed including the Model D Buggyabout, which retailed for $1,000 and had a top speed of 30 mph. Unfortunately that same year, the great Henry Staver passed at the age of 63. Harry B Staver, Henry’s son, had been in charge of the company for a few years as Henry’s health declined. Over the following three years, Harry Staver increased the types of cars manufactured, and he also improved their speed. The models ER, H, I, J, K and L were more modern and higher performing. The Model I, for example, had 30hp and retailed at $1,850. Henry phased-out some of his father’s Highwheelers as well. The Staver line was bolstered to 16 models. He offered as much as 40hp in the beautiful Racing Roadster. 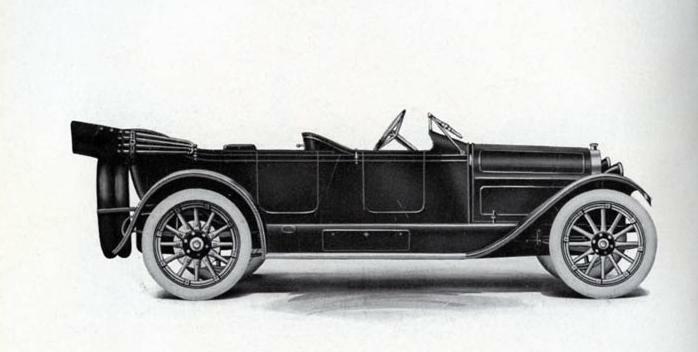 Staver even won an engine efficiency contest in 1910, outperforming some famous brands of the time. The marketing team was also hard at work as they developed a slogan that said “The Staver is a Stayer” and even created a march song. Staver’s addiction to speed was pronounced. 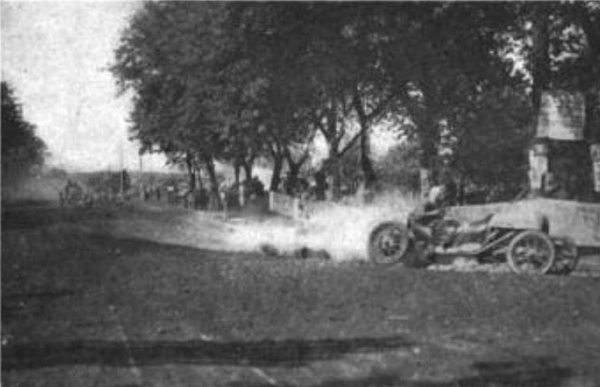 He entered a car in the 1909 free-for-all race at the new Indianapolis Speedway, with a Staver car dealer by the name of Victor Bendix at the wheel. Gus Monckmeier began racing for Staver and winning. Monckmeier placed top three in the Fox River trophy followed by a win in the Algonquin Hill Climb while driving a Staver. Staver returned to Indiana for the Indianapolis 500 where he entered two cars. From 1910 to 1913, life was good at the Staver Carriage Co. Staver was building on three chassis, four different body styles. The large Greyhound 65 had a powerful 71hp inline 6 and could seat four people. 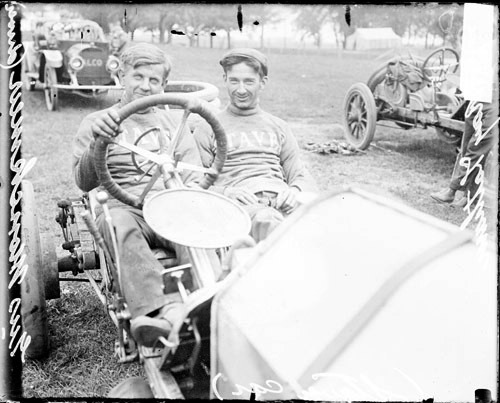 Stavers were becoming famous in the racing scene and even famed stunt driver Curran drove one on the board track at Chicago’s Riverview Park. Staver had reached his pinnacle in the automobile business. The following 12 months showed a steady decline in models offered. Key innovators began to seek employment outside of the Staver business, which was devastating to the company. One bright spot was the record-breaking performance of the Staver 65s at the Newport Indiana Hillclimb with Monckmeier again at the wheel. The Staver Carriage Co. closed their doors in July of 1914. For Harry, the car business was just one of his adventures; Harry transferred his interests and talents to finance. Harry became President of the Chicago’s Citizen’s Trust and Savings Bank in 1922. The Staver Carriage Co. continued as a properties company that Harry ran for another decade as well. Harry passed away at the age of 56. He lived an exciting life during the birth of American horseless carriages. His is just one story among hundreds who attempted to become automobile greats. His story is of course very special to our company and is one that we will continue to explore. There are five known Staver cars that have survived to modern times. The BMW L6 only graced the United States for a single year, 1987. The L6 was a luxury version of the 635 CSi. 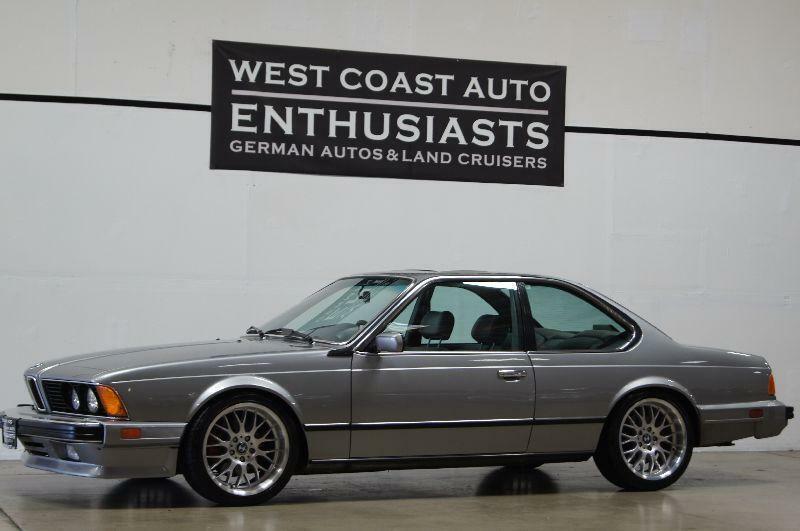 1987 was a banner year for the E24 “Shark” as BMW also introduced the M6 version of the 635 CSi. Unlike the thoroughbred M6, the L6 was built for quiet highway cruising. The L stands for luxury, but one look at the interior and you would think it stands for leather. Leather dash, headliner, door panels and of course, leather seats. BMW adorned this $50,000 car with their finest leather and high quality stitching. One standout luxury feature is the rear seat A/C with beverage cooler cabinet. One look under the carpet and you will find soundproofing material to quite the outside world. The only transmission available was an automatic bolted to the 3.5L inline six. All this luxury did come at a price, and an extra 800 pounds of weight. In classic BMW style, the production of L6 was limited, to a single model year. BMW did continue to make the 635 CSi and the M6 till 1989. The L6 is a unique alternative to the 635 and cheaper than the highly collectible M6. We are thrilled to have this rare car in our showroom. The Land Rover Discovery is a very capable off road vehicle straight from the factory, with hints of British charm. Land Rover wanted to create an SUV with the high-end drivetrain of the Range Rover line that was also affordable to a wider range of customers. While it was first manufactured in 1989 for the British market, it was not introduced to the United States until 1994 as the Series I. The first Discos came with a 3.9L V8 which was the same engine as the Range Rover SE models. All came with a locking center differential. The 1996-1998 models came with an upgraded 4.0L engine that included many upgraded components. In 1999 the United States received the Series II, with over 720 changes. Notable differences included exterior and interior changes for more comfort. The body was lengthened for greater cargo carrying capability. The Series II’s off-road prowess was even further improved with an optional hydraulic suspension system, Hill Descent Control, self-leveling suspension, traction control and electronic brake distribution. All Discos have off road capability that is rarely found in production vehicles. In fact, the Discovery has attained the label of having “legendary” off road capabilities. Many people spend thousands on aftermarket parts to attain the drivetrain and advanced suspension in their trucks/SUVs that the Disco already has stock from the factory. One of the first things you notice when you climb into a Disco is how high you sit. The seat height in the front and rear seats provides a superior view while tackling hills. You will also notice the many buttons and levers dedicated to the 4WD system. The leather is high quality and the head room is cavernous. There are many creature comforts available including Power/heated seats, climate control, wood trim and many moon roofs. 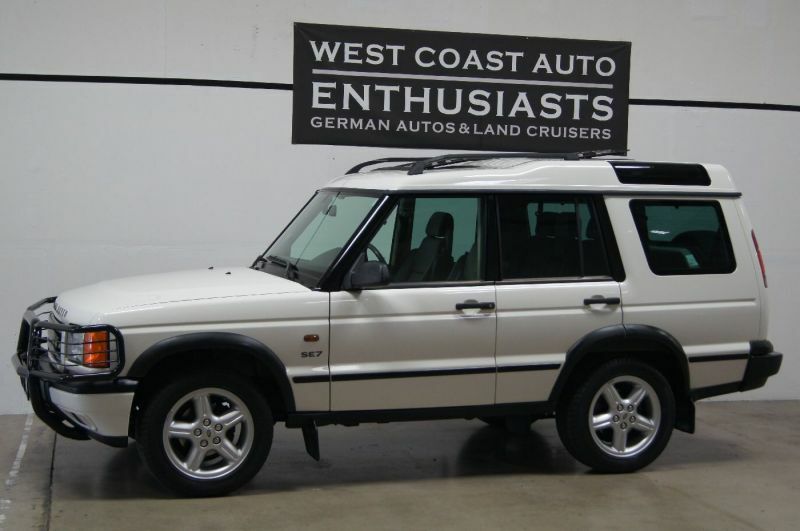 Land Rover Discos have a special place in our hearts here at West Coast Auto Enthusiasts. They are definitely an enthusiast’s SUV.